December 20 – Seasons Greenings Concert Series, U.S. Botanic Garden Conservatory, Washington, D.C.
December 16 – “An A Cappella Holiday with The Capital Hearings”, The Athenaeum, Alexandria, Va.
December 7 – Telecommunications Industry Association holiday party, Potomac, Md. September 15 – Worlds of Our Creation: The Capital Hearings in Concert, Live at 10th and G, Washington, D.C.
July 14 – Baseball Americana Exhibition Family Day, Library of Congress, Washington, D.C.
June 22 – Celebration of Justice Ruth Bader Ginsburg, National Museum of Women in the Arts, Washington, D.C.
June 14 – Politics and Art: District Vox, John A. Wilson Building, Washington, D.C.
June 6 – Friends of the National Arboretum Dinner Under the Stars, U.S. National Arboretum, Washington, D.C.
June 3 – Songwriter Showcase 2018: The Capital Hearings & Chris Urquiaga, All Souls Episcopal Church, Washington, D.C.
December 16 – Holiday Concert at the Downtown Holiday Market, Washington, D.C.
December 10 – “An A Cappella Holiday with The Capital Hearings,” The Athenaeum, Alexandria, Va.
December 9 – Private holiday party, Annandale, Va.
December 5 – Season’s Greenings Concert Series, U.S. Botanic Garden Conservatory, Washington D.C.
September 30 – Path to Here: The Capital Hearings Album Release and Concert, First Congregational UCC, Washington, D.C.
September 9 – Mainstage Performance, Celebrate Petworth Festival, Washington, D.C.
July 16 – D.C. Songwriter Showcase: The Capital Hearings & The Sweater Set, All Souls Memorial Episcopal Church, Washington, D.C.
April 29 – Concert with Ensemble Companio, All Souls Memorial Episcopal Church, Washington, D.C.
March 4 – American Psychological Association Practice Leadership Conference, Grand Hyatt Washington, Washington, D.C.
December 20 – Season’s Greenings Concert Series, U.S. Botanic Garden Conservatory, Washington, D.C.
December 17 – Private holiday party, Annandale, Va.
December 11 – Holiday Concert and Craft Beer Pairing, Port City Brewing Company, Alexandria, Va.
December 4 – “An A Cappella Holiday with The Capital Hearings,” AMP by Strathmore, North Bethesda, Md. November 19 – Fascinatin’ Rhythms: Celebrating Washington, D.C. in Song, Poetry and Dance, Presented by Congressional Chorus, Church of the Epiphany, Washington, D.C.
October 1 – Private event, Mrs. K’s Toll House Restaurant, Silver Spring, Md. September 24 – Revolutions & Revelations: The Capital Hearings in Concert, First Congregational UCC, Washington, D.C.
September 17 – Wedding of Alyssa and Ehren, Rocklands Farm, Poolesville, Md. August 26 – Hamiltunes D.C. Sing-Along, Edgewood Arts Center, Washington, D.C.
June 26 – Festival of Music, All Souls Memorial Episcopal Church, Washington, D.C.
June 3 – International Day Concert, Barnard Elementary School, Washington, D.C.
June 2 – Ambassador’s Reception, Embassy of Switzerland, Washington, D.C.
May 14 – Wedding of Pauline and Patrick, National Museum of the Marine Corps, Triangle, Va.
April 20 – MedStar National Rehabilitation Network Gala, Andrew W. Mellon Auditorium, Washington, D.C.
December 19 – Private holiday party, Annandale, Va.
December 19 – Wedding of Cathy and Bryan, Farmer’s Delight Plantation, Middleburg, Va.
December 17 – Season’s Greenings Concert Series, U.S. Botanic Garden Conservatory, Washington, D.C.
December 5 – “An A Cappella Holiday with The Capital Hearings,” Maryland Hall for the Creative Arts, Annapolis, Md. December 5 – Italian Holiday Family Festival, Smithsonian American Art Museum, Washington, D.C.
October 10 – Spark of Genius: The Capital Hearings in Concert, First Congregational UCC, Washington, D.C.
October 3 – Private event, Mrs. K’s Toll House Restaurant, Silver Spring, Md. June 27 – Wedding of Jaime and Matt, Lydia Mountain Lodge, Stanardsville, Va.
May 31 – New building dedication, All Souls Memorial Episcopal Church, Washington, D.C.
May 2 – “A Cappella Showcase,” Maryland Hall for the Creative Arts, Annapolis, Md. April 23 – Machinery Dealers National Association Convention, National Museum of American History, Washington, D.C.
March 28 – Sing Out for Shelter Benefit Concert, Metropolitan Memorial United Methodist Church, Washington, D.C.
December 21 – Private holiday event, The Chevy Chase Club, Chevy Chase, Md. December 20 – Private holiday party, Annandale, Va.
December 19 – Holiday Concert Series, CityCenterDC, Washington, D.C.
December 18 – Season’s Greenings Concert Series, U.S. Botanic Garden Conservatory, Washington, D.C.
December 16 – Private holiday event, 360 Live Media, Washington, D.C.
December 14 – “An A Cappella Holiday with The Capital Hearings,” Montpelier Arts Center, Laurel, Md. November 8 – Wedding of Merry and Mike, Antrim 1844 Country House Hotel, Taneytown, Md. October 4 – Private event, Mrs. K’s Toll House Restaurant, Silver Spring, Md. September 27 – Seasons: The Capital Hearings in Concert, All Souls Memorial Episcopal Church, Washington, D.C.
June 9 – Voices of Our Nation Choral Festival, John F. Kennedy Center for the Performing Arts, Washington, D.C.
May 3 – Wedding of John and Pablo, Universalist National Memorial Church, Washington, D.C.
March 21 – Performing Arts Council Concert Series, Riderwood Senior Community, Silver Spring, Md. February 23 – SingStrong Benefit Concert, South Lakes High School, Reston, Va.
December 19 – Season’s Greenings Concert Series, U.S. Botanic Garden Conservatory, Washington, D.C.
December 15 – “An A Cappella Holiday with The Capital Hearings,” BlackRock Center for the Arts, Germantown, Md. December 13 – National Gallery of Art Holiday Party, Washington, D.C.
December 7 – Kennedy Center National Committee for the Performing Arts Dinner, Anderson House, Washington, D.C.
December 6 – Clear Harmonies Concert Series with Blue Jupiter, Arlington Temple United Methodist Church, Arlington, Va.
December 3 – Holiday Reception and Tree Lighting Ceremony, Embassy of Canada, Washington, D.C.
November 3 – Concert with MICappella (Singapore), First Trinity Lutheran Church, Washington, D.C.
September 28 – Private event, The Catholic University of America, Washington, D.C.
July 19 – Contemporary A Cappella League (CAL) Showcase, VoCALnation 2013, Philadelphia, Pa.
April 28 – Amica Mutual Insurance Company Board of Directors Conference, Mandarin Oriental Hotel, Washington, D.C.
February 24 – INTERSECTIONS Festival, Atlas Performing Arts Center, Washington, D.C.
February 12 – Siemens Federal Symposium Recognition Dinner, Renaissance Arlington Capital View Hotel, Arlington, Va.
December 18 – Holiday caroling at the Willard Hotel, Washington, D.C.
December 15 – Wedding of Nicole and Bradley, New York Avenue Presbyterian Church, Washington, D.C.
December 14 – National Gallery of Art Holiday Party, Washington, D.C.
December 10 – Corporate event, Gaylord National Resort and Convention Center, National Harbor, Md. December 6 – Season’s Greenings Concert Series, U.S. Botanic Garden Conservatory, Washington, D.C.
October 26 – Choral Arts Society of Washington event, Alexandria, Va.
October 20 – Music and Arts Concert Series, Westmoreland Congregational UCC, Bethesda, Md. 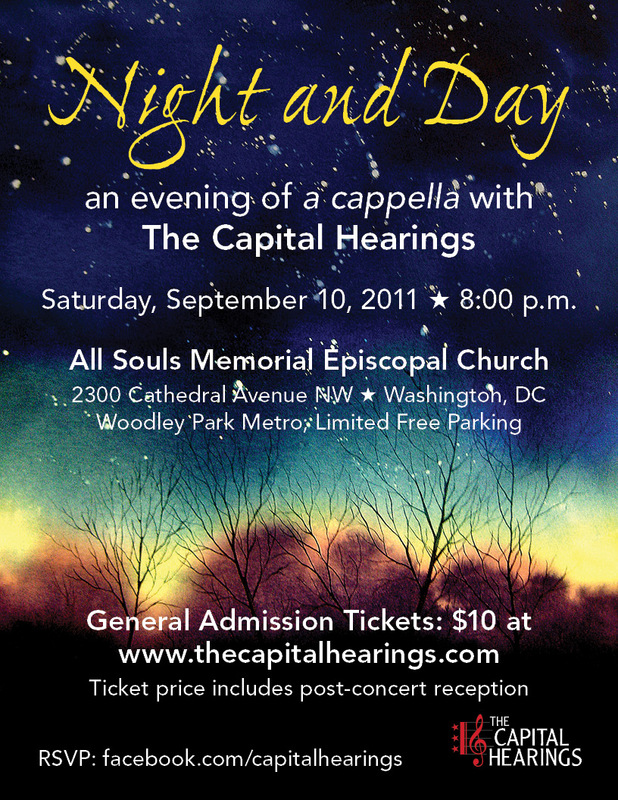 September 22 – Saints and Sinners: The Capital Hearings in Concert, All Souls Memorial Episcopal Church, Washington, D.C.
July 13 – Contemporary A Cappella League (CAL) Showcase, VoCALnation 2012, Arlington, Va.
July 12 – Concert with The Glue (Switzerland), Embassy of Switzerland, Washington, D.C.
June 10 – Private party, The Watergate, Washington, D.C.
May 17 – American Institute of Architects National Convention, Washington Convention Center, Washington, D.C.
April 21 – American Bankruptcy Institute Annual Spring Meeting, Gaylord National Resort and Convention Center, National Harbor, Md. March 3 – Spring Fling Concert, Central Maryland Chorale, Silver Spring, Md. December 22 – Holiday caroling at the Willard Hotel, Washington, D.C.
December 18 – Holiday party, Takoma Park, Md. December 16 – National Gallery of Art Holiday Party, Washington, D.C.
December 15 – Private event, Greenspring Retirement Community, Springfield, Va.
December 14 – “An A Cappella Holiday with The Capital Hearings,” Strathmore, North Bethesda, Md. December 2 – Winter Wonderland Concert, Bethesda Urban Partnership, Imagination Stage, Bethesda, Md. November 2 – Corporate event, National Portrait Gallery, Washington, D.C.
September 23 – Music Forum Concert Series, The Community College of Baltimore County, Essex, Md. September 18 – Private party, Middleburg, Va.
July 30 – Fed. of Defense and Corp. Counsel Annual Meeting, Williamsburg Lodge, Williamsburg, Va.
January 4 – Guest performance at Glasgow Middle School, Alexandria, Va.
December 19 – Holiday caroling at Eastern Market, Washington, D.C.
December 17 – Holiday party, Washington, D.C.
December 16 – Holiday luncheon, Alexandria, Va.
December 6 – Optical Society of America Holiday Party, Washington, D.C.
December 5 – Strathmore Holiday Party, N. Bethesda, Md. December 5 – Holiday caroling at the Willard Hotel, Washington, D.C.
July 7 – Choral Arts Young Patrons event, Residence of the Deputy Head of Mission of the British Embassy, Washington, D.C.